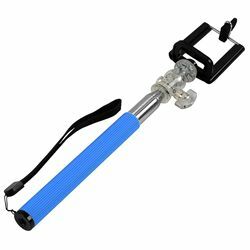 FotoStik gives you the extra stability you need to take action shots or selfies. It includes a padded clamp for phones, plus the standard tripod mount on the monopod for small cameras. The FotoStik fits large phones like the iPhone 6s Plus and extends to 3 feet. The v-groove channel ensures that your phone or camera will stay upright and the ball joint locking adjustor allows you to pivot your phone or camera 90°.